Mung bean is an important pulse crop. It is highly nutritive but is vulnerable to salinity stress. Therefore, the present study was aimed to investigate the protective effect of silicon (Si) against salt stress-induced damage to mung bean plants. Mung bean plants treated with NaCl (0, 50 and 100 mM) showed considerable declines in length and dry weights of shoots and roots. Chlorophyll-a (chl-a), chl-b, total chl, carotenoids and leaf relative water content (LRWC) decreased under NaCl stress. However, supplementation with Si in the form of sodium silicate (Na2SiO3) to NaCl-stressed plants ameliorated the adverse effects of NaCl on growth, biomass, pigment synthesis and leaf relative water content (LRWC). Silicon (Si)-supplemented plants exhibited enhanced chl-fluorescence and gas exchange parameters under normal (non-stress) as well as NaCl stress conditions. 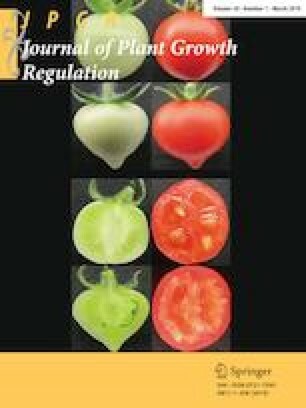 Salt-induced decline in the frequency of stomata and number of leaves per plant under salt stress was significantly recovered with Si supplementation. In addition, application of Si increased the levels of proline and glycine betaine in mung bean plants. Furthermore, histochemical staining tests showed that the levels of superoxide radicals and H2O2 increased with NaCl treatments, which thereby resulted in increased lipid peroxidation (LPO) and electrolyte leakage. Contrarily, decreased levels of H2O2, lipid peroxidation (measured as MDA content), and electrolyte leakage in Si-supplemented plants under NaCl stress indicated the stress mitigating role of Si. The activities of key antioxidant enzymes (SOD, CAT, APX and GR) under NaCl stress showed an increase under the NaCl regime. However, application of Si further boosted the activities of all four antioxidant enzymes in NaCl-stressed plants. The enhanced Na+ uptake and Na+/K+ ratio in mung bean plants accompanied by decreased K+ and Ca2+ uptake under NaCl stress were reversed with Si supplementation thereby resulting in enhanced accumulation of K+ and Ca2+ and decreased Na+. In conclusion, Si supplementation mitigated the negative effects of NaCl on mung bean plants through modifications in uptake of inorganic nutrients, osmolyte production and the antioxidant defence system. The authors would like to extend their sincere appreciation to the Deanship of Scientific Research at King Saud University for funding this research group No. RGP-199. PA, MAA and MNA designed the experimental work. PA and LW carried out the statistical analysis. PA, MA, MAA and SA wrote and revised the manuscript. All the authors have read the manuscript.